When I first started teaching this class in person, the cumbersome title was “Sequential Storytelling: The Death of SuperManga.” This combative name was meant to be provocative. I wanted students to show up realizing I was not here to teach them a commercial art. They would not be learning how to inflate anatomy to fit in with current superheroic trends, nor would I teach these Americans the proper eyes to nose proportion to ape their favorite (anime-inspired) mangaka. I was here to teach a means of self-expression. To hammer that point home, in the first class I would always begin by tearing a cruddy popular superhero book to shreds. That usually got their attention. One guy clearly never recovered from my destruction of some Mark Pacella-penned issue of X-Force. He never came back for the second class. 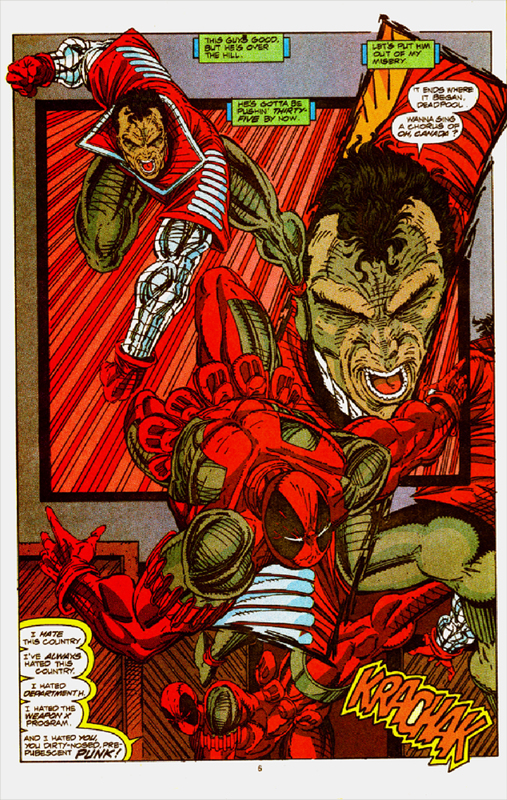 Now, you will see throughout this site that I actually defend Rob Liefeld as an energetic guilty pleasure more than I attack him for being formulaic and borderline incompetent, but the above is really the nadir of sequential art. I would never think of literally destroying a Liefeld issue of X-Force, but sometimes the attraction is that of rubbernecking a car crash. What the hay is going on up there? I have no idea what the relationship is between any of the images, whether sequentially, spatially, or compositionally. There is absolutely no storytelling taking place here. It is like a teenagers notebook cover: a collection of “cool” things to draw (scratchy borders, screaming open mouths, speedlines, crosshatching) with no relation to each other. Why are pieces of bodies breaking out of panel borders? Why is a diagonal panel bisecting the whole page with a body covering half of it up? How can time function between these two panels if they both overlap each other? Why is the impact of one hit important enough to cover-up another panel, but the impact of another unimportant enough to be behind panels and half-off the page? Who is winning? How long did any of this take? Is anyone even hurt? The answer to all of these questions seems to be: Who cares? It looks cool. Comic books are not notebook covers. They are not collage. They are not posters. Fellow English teachers, I know no better illustration of the epic convention of beginning in medias re. This is the very first page of the story; we flip it open and quite literally hit the ground running! And running left to right, in the direction of the read. We can’t help but quickly turn the page, trying to find the physical space to which Batman is running (no ending in a preposition for me — told you I teach English). The strafing bullet fire functions as speedlines, pushing us to the following page as well. The gorgeous red block letter-shapes in the background give the whole a repeating rhythm of graphic elements while echoing the title. 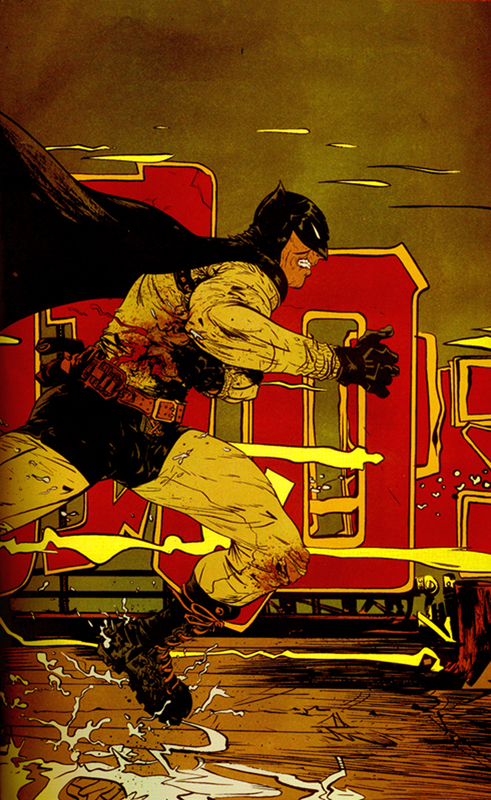 The red also draws us to its companion on Batman himself, so even amidst the flurry of action forcing us onward with him, we note that Batman is bleeding profusely. Our hero is in big trouble from page one, and Paul Pope’s not going to ease up on him at any point in this speedfreak of a comic. The question is again: What the hay is going on? But now that question is aimed at the story, where it belongs, not the art. And we want to know the answer. That desire, along with this perfectly composed image, hurls us on. On the next page we zoom in on Batman’s feet to feel the impact on his struggle. This close-up, in addition to emphasizing the rain and danger of careening across slippery rooftops, amazingly gives us sound effects that aren’t there. It also works in tandem with the following image of the dogs’ legs that pursue the caped crusader. This juxtaposition invites comparison between predator and prey, and leads us to wisely speculate on the Bat’s animal nature just before he performs a feet that is beyond human. The last panel finally gives us a nice clean shot of his pursuers, but Pope’s unbeatable inking has here done something as smart as it is beautiful. By leaving out those obnoxious “halos” of white that lesser artists employ to separate black forms, Pope allows the dogs to function visually as one monstrous beast, tooth and claw of a whirlwind of destruction blazing across the page. 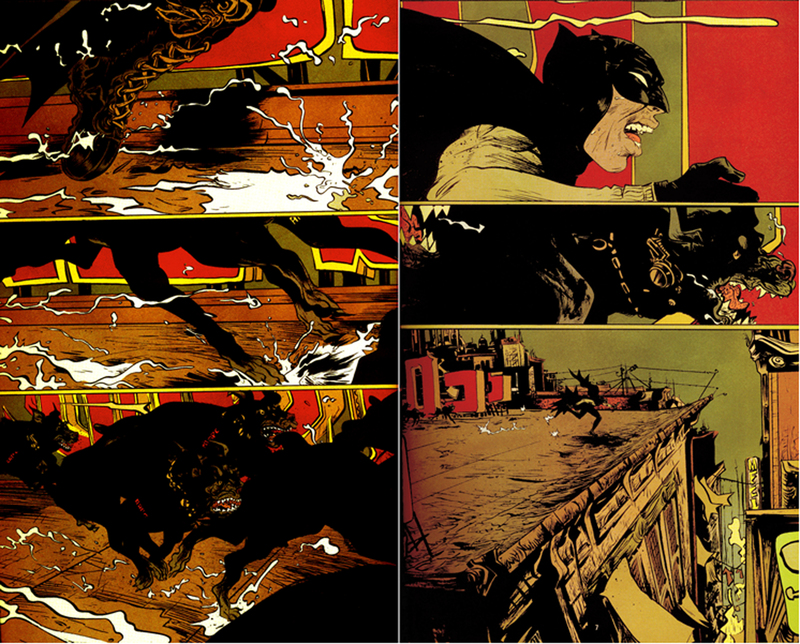 The visual comparisons continue on the following page, contrasting Batman’s exhaustion with the dogs’ mindless bloodlust. The bottom panel is the best yet. Pope pulls back to slow the pace just a hair and give us our locale. We now see just how hopeless his plight is. He is not just hurtling towards a complete dead-end many stories above the welcoming and fatal earth, he is staggering full-bear towards it! Pope’s perfect postures show a stumbledrunk Batman tripping over his own feet as shear willpower forces him forward. Our hero is fallible! We have connected with him empathetically, three pages in, and he hasn’t uttered a word. Fallible — and fall-able? What a page turn!!! Our fears are allayed as our breath is taken. I know of few shots in the history of superhero-dom that so magically emphasize the miraculous feats performed by those who are beyond our mortal means — and that is the very appeal of the genre! Pope accomplishes this by pulling waaaay back and plunging down to the ground to put us in the awed human, all too human bystander’s place. 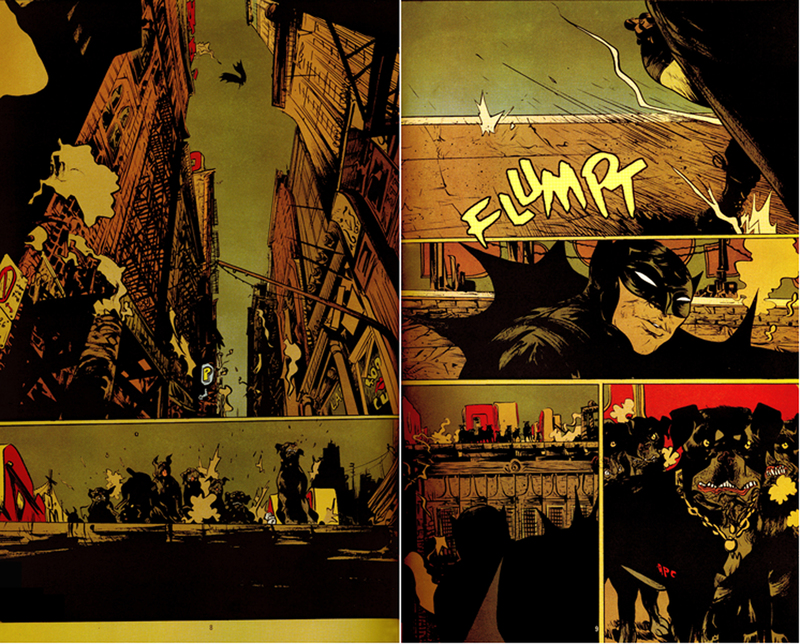 That diving negative scar of air holds Batman hovering in his awesomeness between the buildings. His superheroics last forever. And the abundance of background detail to take in assist this quiet pause. The bottom panel, to return to epic conventions, has the dogs as chorus echoing the reader’s emotions. They stand for the audience, and they stand in awe. The first sound effect in this boisterous bedlam is that wonderful FLUMPT of success. The shot is where it needs to be: right on Batman’s feet again. And then, for the first time in the book, Batman defies the read to turn left and gloat. The relentless onslaught has stopped. He gets the brief rest he has earned. Across the great divide, his enemy stands shocked, winded and defeated. Throughout this class, I will never ask creators to steer toward or away from any genre of work. I will never tell you comics works better for contemplation rather than carnage, or vice versa. I will never tell you that “cool” is not something worth aiming for. I’m just here to show you a better way.